Happy Soapy Friday everyone! Hope you are getting ready to drink some green beer tomorrow and enjoy the weekend. There will definitely be wine enjoyed somewhere, SOMETIME for me. Ugh. I can't even begin to explain the chaos that is going on in my life right now. Long story short, we listed our house for sale and have had a bidding war going on. So, we will be moving soon, hopefully it will be into another home that we own, but the market is so HOT right now who knows. If not, then we will rent again. On top of that, my job wants to send me on a traveling odyssey for the rest of the year...just really bad timing. Next week, I'm in Fort Worth, TX. Anywho, on to soap, shall we? First, I tried to rebatch some old soap that I didn't like. 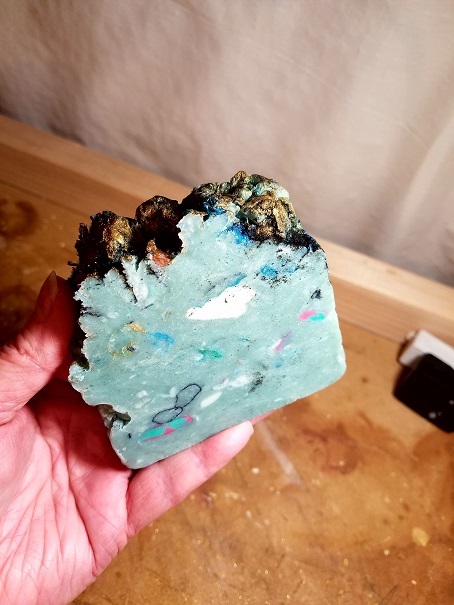 I "tried" to go for a turquoise stone look that is so hot right now, but ended up with soap that looks like 1950's terrazzo tile. LOL! 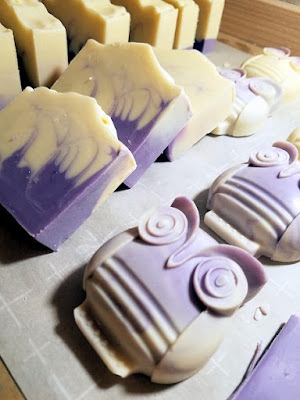 Second, I wanted to retest a few theories about a certain fragrance oil (Rosemary Mint) and using mango butter in my soap. 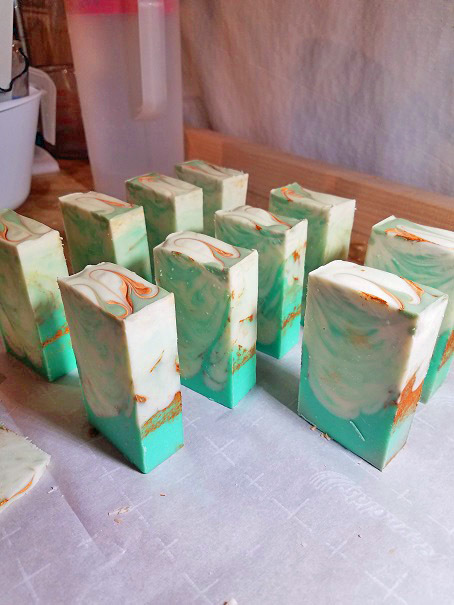 About 2 months ago, I made a beautiful green soap using this fragrance and my usual recipe that contains mango butter. When it cured and we tested it, the soap weirdly lost it's scent in the shower (but smelled great dry!) and had a more waxy, crayon scent. This has never happened before and I figured it was either two things: One, the mango butter I was using was right at its expiration date and it went bad I think, and two, the fragrance oil may not be sticking. So I made another test batch. Both with the same fragrance (Rosemary Mint) but only one containing fresh mango butter. I wanted to test if it was the fragrance, the expired mango butter, or just mango butter itself. The conclusion: I think it is a little of all three! The fragrance really has toned down, which has allowed the "natural" soap scent to come thru. 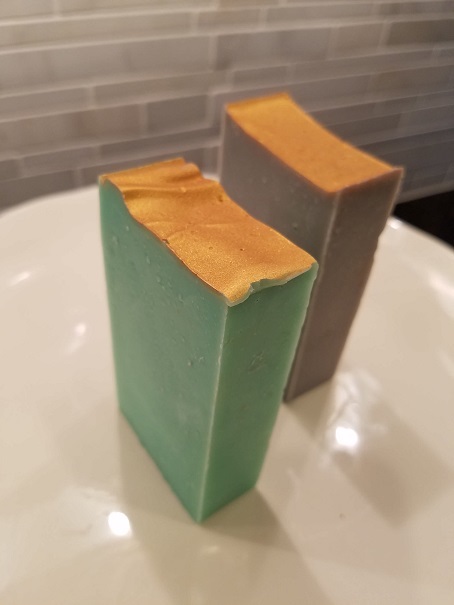 I CAN smell a difference between the non-mango butter bar and the one containing mango butter, BUT, it's not anywhere near the scent I had from my very first batch using old mango butter. In other soaps that have mango butter, I can't smell it at all. Note to self - Use fresh mango butter always and don't use that fragrance again. Now, finally my little hooters! Aren't these just the cutest things ever? They are perfect for medium-sized bars of soap. These were made with Lavender Lemongrass essential oils. Heaven! Hey! I could love that beautiful Terrazo soap!